So at the moment I have an unhealthy obsession with Shabby Chic. If it has gingham, owls or foxes I love it! I've been trying to convert my room into a Shabby Chic den and this is all I've done so far. I have a longggg way to go to achieve the whole look but I can live with this. The lyrics on the wall are from a song by Eddie Vedder called 'Guaranteed'. Although they're not in the photo, I have clouds hanging from the ceiling. Oh yeahhh! It took agesss to make them. I used cotton wool over paper maché balloons and sewed beaded raindrops onto the bottom of them. I will update with a picture soon. To add to the room I bought a red gingham blackboard which will help majorly since I have a memory like a fish, no joke! I'm also bidding for crazy cute cushions. I want to fall into a heap of cushion clouds when I go to bed! Anyhooo I better go to bed! Night all! Your room is simply ADORABLE! Not sure what shabby chic style is, but if it's along the lines of how your room looks like, I think it's amazing! Hey! I'm following you now :) I love your blog. Will read through it now. But yeah, shabby chic is amazing. I would love to see your work. 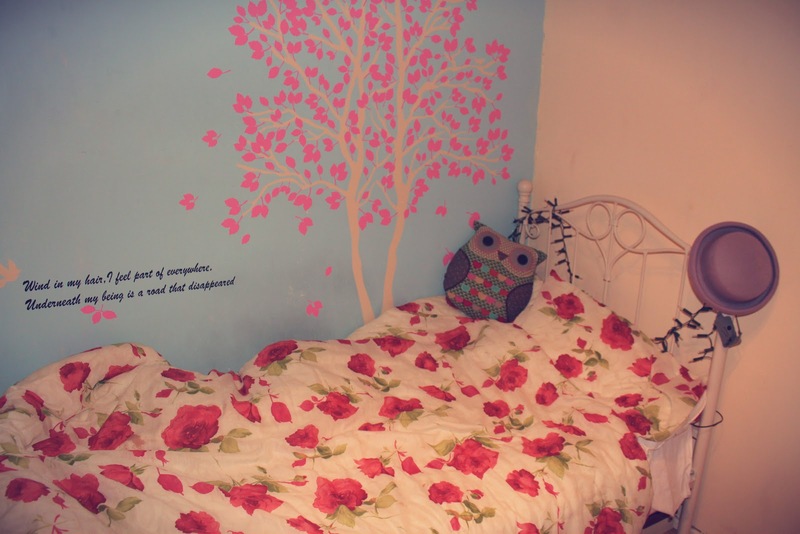 The cherry blossom tree on the wall is so cute! Can't wait to see more pictures of your room!